Off Marco Island, FL, about twenty miles out in the Gulf of Mexico, there is a, "hole in the bottom of the sea." Locally known as, "The Blue Hole," there could be no better way to describe it. Measuring about 200' in diameter, the hole is in about 70 feet of water. Being in the Gulf of Mexico, visibility is almost always pretty limited. There has been a great deal of speculation and debate amongst local anglers about the depth of the hole, and I have spoken to divers who "knew a guy who knew a guy" who determined that it was (you pick the depth). Nobody I have ever talked to could tell me from personal experience just how deep that hole is. Sometimes, I suppose there are things a man's just gotta know! I discussed it with Randy Hamilton, the diving instructor at Aqua Adventures on Marco Island, and we decided that we would try and find out. I grew up on the Navy base in Cuba where scuba diving was one of the few forms of recreation, and the underwater environment was a diver's dream. As a Dive Master with a lifetime logged underwater, I was particular who I wanted to try this with. Randy and I have been scuba diving together many times and I know him to be blessed with a sound working knowledge of dive physiology, a significant amount of experience, and more than his fair share of common sense. The first thing we needed to agree upon was the point at which we would quit. The depthfinders fishermen use go crazy when they pass over the hole, so many people believe that the hole might be as deep as a thousand feet. We planned a bounce dive to 300 feet, agreeing that we would stop at that point no matter what. We planned our decompression stops using US Navy Dive Tables - the tables available to sport divers thru PADI and NAUI do not provide data related to dives like this. In reality, nobody does. The thing to remember is that the US Navy Dive Tables were developed using young, athletic men, and their nitrogen absorption profiles are not comparable to those of old fat men, or young athletic women. 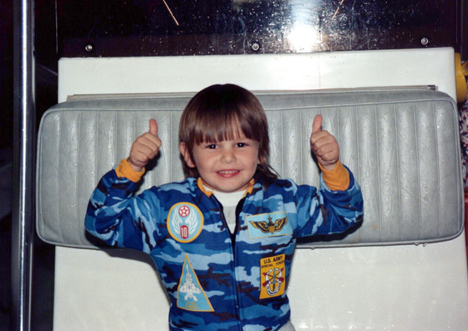 Although Randy and I were in excellent shape, we planned our dive profile conservatively - very conservatively. 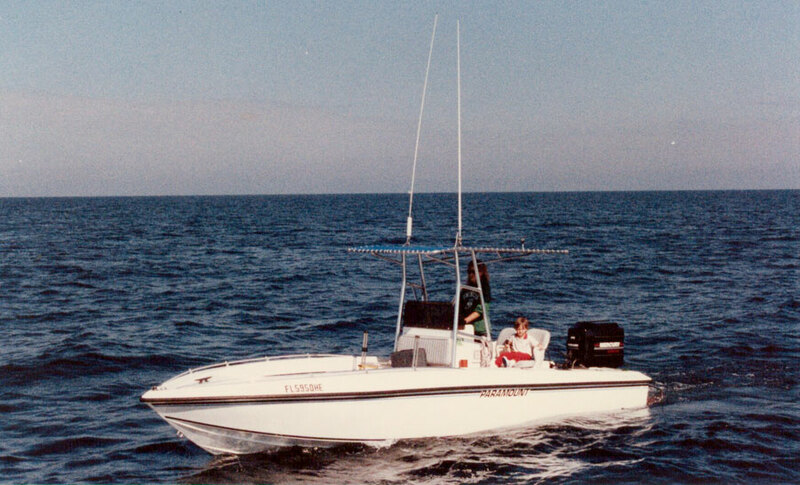 My 21' Paramount was a fast boat, capable of making 20 miles in about that many minutes, but tanks and equipment slowed us down a bit. Once we located the hole, it took a few minutes to "hook up." The Blue Hole is not the place to use a conventional anchor, a grapnel hook (which looks like a huge treble hook), coupled to about fifteen feet of chain, and several hundred feet of anchor line, is the best tool for the job. When we slipped over the side, our boat was securely connected to the hole. We positioned extra tanks to allow for decompression schedules as we descended. 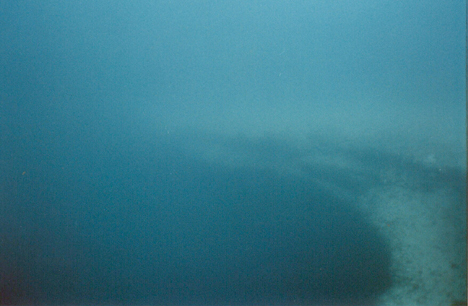 Looking down into the dark blue hole reminded me of the "drop off" we had in Cuba. Randy and I didn't wear swim fins. We were planning on sinking, not swimming and we had concerns that fins might stir up silt and obstruct our visibility. We wore neoprene diver's booties instead. 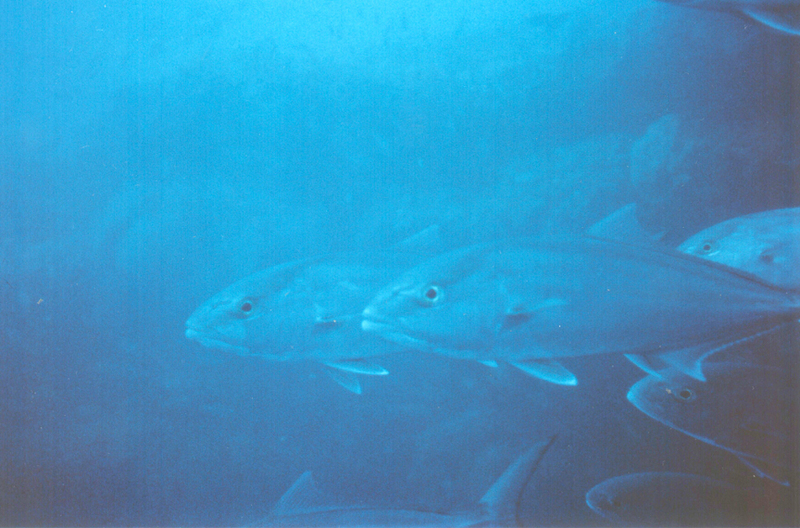 As we dropped below the Blue Hole's rim, we encountered a school of jacks, many of which would have weighed thirty to forty pounds. In looking at the picture, you can see that there was a fair amount of ambient light. Within just a few more feet, that began to change rather dramatically. As we descended, it was is if someone turned down the dimmer switch - and quickly. 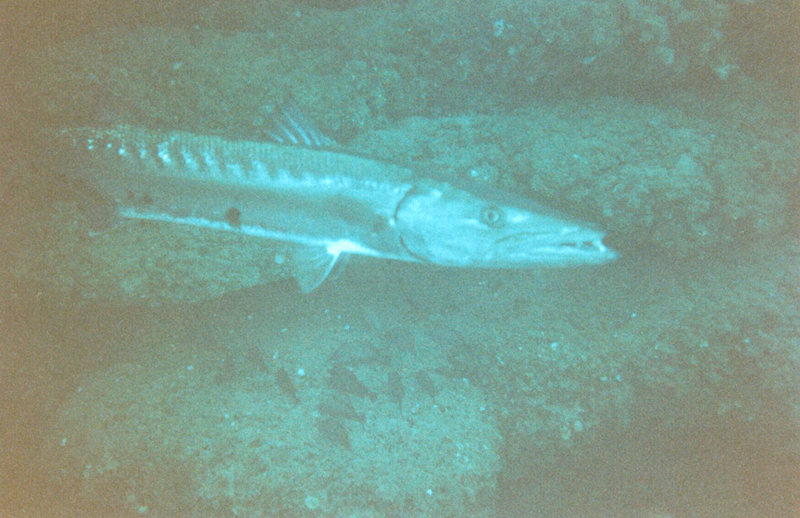 When I shot the picture of this five-foot barracuda, you can see the flash reflected off the silver at the base of his pectoral fin. Looking at the lower right corner of the picture, you can begin to get an idea how dark it was just below us. Dark, and devoid of life - the barracuda was the last living thing we saw. As we passed the 100' mark, the air in our buoyancy compensators began to compress and the more it compressed, the faster our descent, and the darker the water around us became. The thing we hadn't imagined can best be demonstrated by standing a roll of paper towels on a counter top in a brightly lit kitchen. Look down that tube and you cannot see the countertop -- you can only see a couple of inches (assuming the light isn't shining straight into the tube). Diffuse light does not pass down a tube - especially in water. It got darker, faster, than we would ever have imagined - in no time at all, it was like sinking in ink. Naturally, we brought diving lights, but as any diver knows, they project a narrowly focused beam. Those lights do not light up an area very well so, other than what we pointed them at, we had no idea what was around us. If you had our descent on film, it would look like a couple of drunk Jedi Knights falling through space battling away with light sabers. It was disorienting, and it was difficult to try and keep an eye on our surroundings, while watching our depth gauges, and keeping an eye out for Lord knows what, as we plummeted toward whatever awaited us on the bottom. One thing I did notice, the water was not salty at all. Aside from taste, what does salt water have that freshwater does not? The answer is, "Buoyancy!" We were descending through fresh water, and the decreased salinity made us sink faster. It also explained the absence of life - the saltwater fish that could get there cannot live there and the freshwater fish that could live there cannot get there. Bearing in mind that the known enemy was time - it was critically important that we get down and back up as rapidly as possible and there are severe limits on how fast you can ascend. For us, dropping fast was a good thing since we wanted to get to the bottom quickly. That makes perfect sense, and it's all well and fine while you're hurtling thru black space until, all of a sudden, you get this mental image of razor tipped stalagmites sticking up from the bottom below you. As we past the 200 foot mark, instantly, and fortunately, with no warning whatsoever, we discovered that nothing could have been further from the truth. "Splat" we went into the underwater equivalent of quicksand, superfine sand with a texture very similar to cosmetic liquid make-up. The Blue Hole is a freshwater spring where water has percolated up through the sand since "once upon a time," or perhaps even the beginning of time. That forever percolating effect has worn the sand down to a liquid paste - much preferable, in my view, to razor sharp pointy things! Randy and I noted the depth, 212 feet, and confirmed that we were each in possession of our senses - nitrogen narcosis being a very real concern at that sort of depth. We began our ascent immediately, but slowly, taking much longer to get to the rim of the hole than we took getting down. Fortunately, we found our decompression tanks right where we left them; but I must tell you that nothing could be more boring than decompression stops. If you ever choose to try such a thing, it's about like watching paint dry, so be sure and bring along a paper back book. I'm completely serious. Paper back books don't survive long underwater, but tucked inside your wetsuit, they will certainly survive long enough. You simply tear away the pages as you read them - the pages will completely disintegrate in a few days. We made that dive thirteen years ago, and I doubt if my seventeen year-old son Jeremy can remember standing by on that boat with his Mom. I suppose that's why I write these things.